We are a full service, one stop facility where boarding, grooming and training are all expertly administered by our trained and skilled staff. We also stock a variety of quality training supplies and pet products. 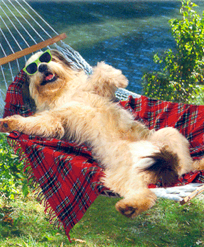 Ben-Jee Kennel’s mission statement is simply to offer the most comfortable and relaxing environment for our guests. We live on the premises helping ensure your pet’s needs are always priority number one. Please visit our facility and it will provide you a level of comfort that is matched only by the comfort we will provide your pet. We just added a back-up generator to protect our guests when the power goes out. Then, when you leave your pet at Ben-Jee Kennels, the experience will transform your guilt and worry to confidence and joy. Our Ben-Jee staff are all dog lovers. It is an uncompromising requirement of joining our staff. 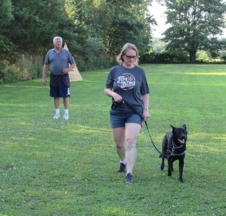 We invite you to see and experience our facility and ultimately take advantage of what we are confident will be your best kennel experience ever. Leaving your pet is like leaving a member of your family. At Ben-Jee Kennels, we take the worry and heartache out of boarding your pet when you need to leave your home. That’s why we consider your pet as our guest, not just another animal to care for. You will feel 100% secure knowing that your pets are receiving the same loving care and attention that you give them at home. This philosophy is evident in every aspect of our four acre facility in Tylersport, PA where we treat your pets just as if they were our own. When you choose Ben-Jee Kennels, your biggest worry is whether your pet will ever want to leave! Click here, type in your email address and hit send. 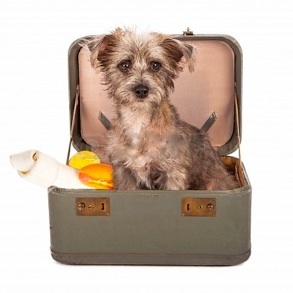 Summer vacations mean boarding season and when it comes to your dog, there are few things worse than the honking and hacking of canine cough, commonly referred to as kennel cough. Your dog can catch this infection while at a kennel when they are exposed to other infected dogs, although the vast majority of dogs do not take it home. Having your dog vaccinated against this infection dramatically decreases catching Canine Cough at a kennel but there are a host of other places and ways your dog can be infected such as dog to dog, germs hanging out on contaminated objects like water bowls, bones, toy balls or even pieces of wood chomped on by other dogs. It is often spread in enclosed areas with poor air circulation. Training classes, veterinarian offices or dog grooming facilities can all spread the infection from dog to dog if improper air circulation is present. Be aware of small, enclosed rooms where other dogs are present in facilities where vaccinations are not required. Canine Cough is contagious and your pet can catch it from sharing a water dish or simply by sniff, meet and greet with other dogs. The best kennels, including Ben-Jee Kennels, require proof of recent vaccinations before they agree to board or even groom your pet. Keep in mind that vaccinations are not useful for dogs who have already caught the infection. What Is Canine or Kennel Cough? Kennel cough is a term loosely used to describe a complex of infections—both viral and bacterial—that causes inflammation of a dog’s voice box and windpipe. It’s a form of bronchitis and is similar to a chest cold in humans. Though it usually clears up on its own, kennel cough is highly contagious to other dogs. Young and unvaccinated dogs are at greatest risk. Symptoms include a persistent dry cough with a “honking” sound is the main clue your dog is infected. In most cases, your pet will appear healthy except for the cough. Appetite and activity level usually won't change, but don’t be alarmed if she gags and coughs up a white, foamy phlegm—these signs are often worse after exercise, or if she’s excited or pulls against her collar. Some dogs may also develop a fever and nasal discharge. If you suspect your dog has kennel cough, immediately isolate her from all other dogs and call your veterinarian for instructions or a visit. In most cases, the signs of canine cough gradually decrease and disappear after three weeks. Young puppies, elderly dogs and dogs with weak immune systems could take a little longer to recover although symptoms may linger even longer on occasion. In some cases, animals may remain infectious for long periods of time even after the symptoms have cleared up. For more information speak with your canine care provider. Winter months means your dog is exposed to long periods of dry air from heat as well as dry air from very cold days outside. It’s not uncommon for this to translate into dry and itchy skin for your dog. While a full, glossy coat is the sign of a healthy dog, dry, flaky skin can make the dog's fur seem less luminous and unattractive. Consult a professional as soon as you notice an excessive amount of flakes in your dog's fur as it may be a sign of a more serious medical condition. You can take steps to prevent dry and itchy skin in your dog this time of year. These tips also work in the warm months when other factors may be the root of your dog’s condition. Most important is to visit your vet if you observe the condition seems to be severe. It is common for dry skin and itchiness to be a symptom of a more serious condition in which case you’ll need to follow the vet’s instructions diligently. Next, check on the type of dog shampoo you’re using. Even if your pet doesn’t have dry skin symptoms, it’s a good idea to purchase moisturizing dog shampoo and omega-3 food supplements from a trusted veterinarian. The shampoo will restore moisture to the skin, and the omega-3 will help it retain the moisture for longer periods. Many pet owners mistakenly believe shampooing your dog often wards off dry skin. But too many baths can actually dry out your dog’s skin so keep shampoos to once monthly and use the moisturizing shampoo. It is best to massage it into the fur firmly to ensure thoroughness and remove old flakes of dried skin. Brush your dog in the evening to remove the loose flakes of skin. Use a brush specially designed for your dog's hair type for the best results. Regular brushing increases the production of skin oils that will fight off dryness. Add the omega-3 supplement to your dog's food and try to increase proteins which will increase the skin health and help it produce more moisturizing oils. Bring your dog inside on dry days with excessive heat or days with a low temperature. If it's too hot or too cold, it can sap your dog's moisture from its skin. If following these tips doesn’t bring improvement to your dog’s skin, consult your vet or let Ben-Jee groom your pet with our hypo allergenic shampoos! Say it ain’t so! Colder weather is on the way. Colder weather can bring discomfort for all of us but too often responsible pet owners take their pets for granted regarding their comfort and care when the temperatures become frigid. The following information and tips are very useful and sometimes even the obvious can be overlooked. 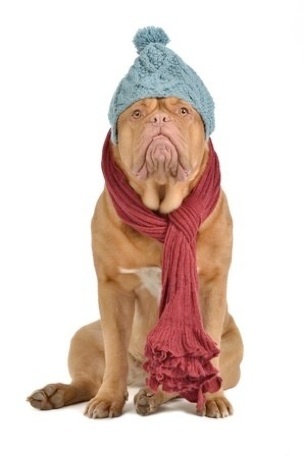 • Don't leave your dog outside in the cold for long periods of time. Wind chill makes days colder than actual temperature readings. Be attentive to your dog's body temperature, and limit its time outdoors. • Adequate shelter is a necessity. Keep your dog warm, dry and away from drafts. Tiles and uncarpeted areas may become extremely cold, so make sure to place blankets and pads on floors when your pet is sleeping near doors, windows and fireplaces where drafts can be present. • Be extra careful when walking or playing with your pet near frozen lakes, rivers or ponds. Even shallow streams can be dangerous. Your pet wants to play no matter where or when but they are usually unaware of hidden dangers. Depending on the part of the country you live, you are probably already seeing signs of spring coming. While we all look forward to flowers blooming again, with the spring and warmer temperatures comes the fleas. Save you and your dog some aggravation by preparing for the spring early. It’s a lot easier (and less expensive) to take the time to prevent fleas now than to deal with an infestation later! •Work your way in. Pest control experts say you should treat your outside areas first, then interior areas, and last but not least your dog (and any other pets). There are several organic, chemical-free, and inexpensive ways to treat your home for fleas. Your local pest control can make recommendations. •Consult your vet. Fleas are one of the most common and irritating parasites that affect dogs. They love the warm habitat a dog’s skin and hair provide. They can survive more than 90 days with a food supply; that is, by biting and living on your dog’s blood. They then lay eggs in their coat, which can drop off your pet and into your carpet, hatch and the cycle continues. The right flea preventative can stop this process in its tracks. Your vet should have the best information to what is right for you and your dog. •Clean your vacuum. Flea larvae can live in your carpets and other household furniture. Make sure to clean your vacuum often and well with soap that kills any remaining flea larvae before it hatches. •Baths before beds. If you take your dog out for a hike or other outing in nature, especially in wilderness areas that are ripe for fleas, make sure they are bathed in your choice of flea shampoo before entering the house. •Get a cut or trim. It can be more difficult to inspect for fleas on long-haired breeds. During the warmer months when fleas are rampant, consider giving your dog a good grooming. Many dog owners choose to shave their dog’s coat during the warmest months of the year. Others choose to use one of the many coat thinners available to make brushing and checking for fleas easier. Consult your groomer or vet about the various options available. Dangerous and deadly: Common items that could poison your pets. Last year, there were over 100,000 cases of pet poisoning in the U.S., many involving items commonly found in most homes.1 By learning what common foods and plants may be toxic to your pets, you can keep your furry four-legged family members out of harm’s way. There’s a reason it’s called "people food." Sharing what’s on your plate with your pets is never a good idea. What may be delicious to you can be deadly to them. Your pet could be poisoned. Now what? First and foremost, stay calm. Every second counts, but it’s more important to make sure you have the information you need to help a vet make a quick diagnosis. 1. Remove your pet from the area. 2. Collect a sample of the material ingested, preferably in the original packaging. Pools/Lakes: Never leave your pet attended when they are swimming and always make sure they have an easy way out or the pool is enclosed and inaccessible. Fishing Tackle: Colorful stinky fishing lures are very tempting to cats, dogs and birds and can be very dangerous. Hooks are usually barbed and can not be backed out until the barb is removed. Never try to remove these hooks on your own. Seek veterinary help to prevent tissue trauma. Pick up Trucks: Dogs love to feel the wind in their faces but uncovered truck beds are a very dangerous place for your pet. Sudden stops or turns can throw your pet from the truck and can cause a major injury resulting from a fall or by being hit by an oncoming car. Additionally, there is a lot of debris and insects moving at high velocities that can cause eye injuries. It is best if your pet is secured inside your truck. Cars: Never leave your pet unattended in your car. While it is never a good season to leave a pet in a car attended, summer can be particularly deadly. Don't lull yourself into a false sense of security by leaving the window open. It never takes long for heat to rise and you're pet to suffer from heat stroke. Heat Stroke: This is very serious and you should always seek medical care. It does not always take much on a warm day for a dog or cat to experience heat stroke. If your pet experiences a heat related issue cover them with a cool wet towel and transport to your veterinarian immediately. Bite Wounds: Many of these dogs at dog parks are harmless but when faced with certain conditions a dog can turn suddenly and bite. •Stay close to your pet. 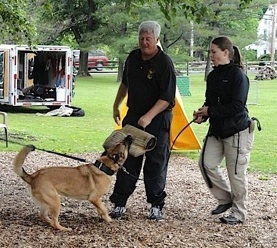 •Introduce your dog to other dogs and watch their responses. •If all is friendly, then it is safe to let them play. 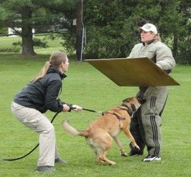 •If any type of aggression is shown, take your dog to another part of the park and find a new playmate. •Do not try to break up a fight by getting in the middle. Use leashes or water to separate the dogs. •If you or your pet receives a bite wound, seek medical help to prevent infection. Windows: Whether you live in a private home or an apartment, you'll be tempted to open windows to let in the fresh air. Be sure to keep screens or protective bars on your windows to prevent your pets from escapes or falls. And bird owners should make sure their feathered friends are protected from drafts. Lawn Care: Lawn chemicals can be very toxic if ingested. Try to keep your pet off new fertilized lawns for 24 hours. Always save to original bag for later reference if ingestion occurs. If your pet does ingest these chemicals, contact your veterinarian, ASCPA, or us at the Veterinary Emergency Service. Spring Clean-ups: Keep all household cleaners and chemicals out of reach of your pets. 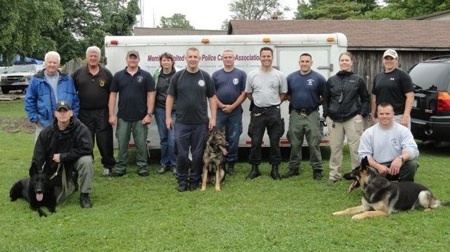 Ben-Jee Kennels hosts Pennsylvania Members of the United States Police Canine Association. Thanks to Melanie Howe and Bob Swan for photographs and assistance. IMPORTANT NOTICE FOR BOARDING PETS: Since many veterinary hospitals are adhering to HIPPAA laws for pet/pet owners; please contact your veterinarian and make sure we have an updated record of your pet's vaccinations. HIPPAA laws are regulations that protect the privacy of your personal information. Pets that do not have DHLPP, RABIES, and BORDETELLA (kennel cough) cannot be admitted for boarding - please make sure this is taken care of prior to your arrival. Thank you for your cooperation and making your pet's reservation an enjoyable experience! 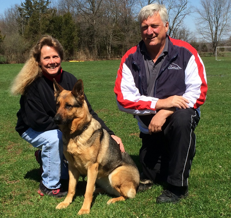 We would like you to know how much we appreciate your knowledge and professional expertise with dogs. We rescued Maisha back in May and when we had her home a few days it was obvious she had some emotional hardships. We did not know if we could handle these hurdles, and we thought that we might have to give her back. She wouldn't go on walks and hid in the corner all day. 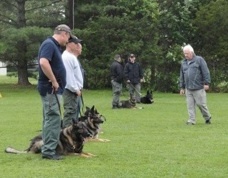 Then we started going to Ben Jee's for obedience class. The first day we were there you gave us the tools and some teaching that changed everything. Long story short, we now have a loving playful and behaved pet, thanks to what you have taught us. We see a long and healthy relationship with our Maisha. The way the both of you understand dogs makes me think you were puppies when you were growing up. Many thanks for your patience and understanding. We will see you soon. Ben-Jee note: It is always rewarding to hear of a story like Maisha’s. If you’re having trouble with your pet, don’t hesitate to call us to learn about our Obedience and Training Classes. Nina and Maisha under the watchful eye of Jim. • Your dog needs a well-groomed coat to keep properly insulated so regular grooming is a good idea. Short- or coarse-haired dogs may get extra cold, so consider a sweater or coat. Long haired dogs should have excess hair around the toes and foot pads trimmed to ease snow removal and cleaning. If you do the trimming, take care not to cut the pads or other delicate areas of the foot. • If your pet spends a lot of time outdoors or is a working animal be sure to provide extra calories. It takes more energy in the winter to keep body temperature regulated, so additional calories are very important. • Towel or blow-dry your pet if it gets wet from rain or snow. It is important to dry and clean its paws, too. This helps avoid tiny cuts and cracked pads. A little petroleum jelly may soften the pads and prevent further cracking. • If you must leave your canine alone in a car, be very diligent to take proper precautions. If the car engine is left on, the carbon monoxide will endanger your dog's life. If the engine is off, the temperature in the car will get too cold. Like people, dogs seem to be more susceptible to illness in the winter. Take your dog to a veterinarian if you see any suspicious symptoms. Don't use over-the-counter medications on your dog without consulting a veterinarian. When your pet gets sick, they are unable to communicate directly what’s wrong. Consequently, you need to be more attentive to your dog’s behavior, especially in winter months. If you see unusual behavior such as more frequent urination, lethargic behavior and such, pay close to attention to such changes. A trip to the vet can actually save money when compared to the cost of expensive procedures or medications. • Antifreeze, which often collects on driveways and roadways, is highly poisonous. Although it smells and tastes good to your dog, it can be lethal. • Rock salt, used to melt ice on sidewalks, may irritate footpads. Be sure to rinse and dry your dog's feet after a walk where irritants come into play. • Your dog is just as likely to get dehydrated in the winter as in the summer. Snow is not a satisfactory substitute for water so be sure to keep your pet fully hydrated. • Frostbite is a serious and common winter hazard. To prevent frostbite on its ears, tail and feet, don't leave your dog outdoors for too long. • Be very careful of supplemental heat sources. Fireplaces and portable heaters can severely burn your dog. Make sure all fireplaces have screens, and keep portable heaters out of reach. • Holly, mistletoe and poinsettia plants are pet poisons! Make sure they are kept in places your dog cannot reach. • Review holiday gifts for dogs to make sure they are safe. Items such as plastic toys and small rawhide sticks may be dangerous. • Remove holiday lights from lower branches of your tree. They may get very hot and burn dogs. • Watch out for electrical cords. Pets often try to chew them and may get badly shocked or electrocuted. Place wires out of reach. • Avoid using glass ornaments. They break easily and may cut a dog's feet and mouth. • Don’t use edible ornaments. Your dog may knock the tree over in an attempt to eat them. Also, commercial ornaments may contain paint or toxins in the preservatives. • Whether your tree is live or artificial, both kinds of needles are sharp and indigestible. Don't leave your dog unattended in the room with the tree. • Tinsel is dangerous for dogs. It may obstruct circulation and, if swallowed, block the intestines. • Alcohol and chocolate are toxic for dogs, even in small amounts. Keep unhealthy, sweet treats and seasonal goodies out of reach. • The holiday season is a stressful time for dogs. Try to keep a normal schedule during all the excitement. 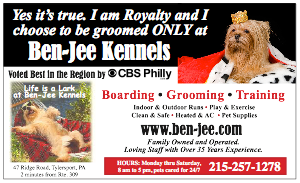 The AKC is the source for the above information and is presented here as a convenience for Ben-Jee Kennel visitors.